I knew that i wasn’t going to be disappointed in this 2nd installment since i love the genre, and The Testing and ‘Study Guide’ were both really great. In this 2nd book, we come upon the group of students that had passed through the testing and are in their ‘Early Studies’ while they are waiting to find out what their Area of Study will be. There’s a lot of tension of course though because as was the case in the Testing, if you don’t pass, you fail, and if you fail, you get redirected and no one quite knows what that means. Because of this Cia is extra nervous because she’s worried that she won’t pass, and while taking her exam, she doesn’t have enough time to fully complete it so she’s worried that she will be redirected. Low and behold though, she passes and instead of being placed in her preferred area of study (Mechanical Engineering), she’s put into Government, the area that she’s LEAST excited about, and this worries her more since she feels like this is setting her up to fail even more. That’s not where her troubles end of course. As an ‘Induction’ test for the department, she and the other first years have to go through a challenge that will determine who’s a good leader, and who maybe isn’t strong enough to make it. Through this test, Cia continues to be challenged on who she can trust and who’s out to see her fail. She makes it through the test of course, but obstacles keep getting thrown at her. If you remember Michal from the first book, the official that was on Cia’s side and helped her out a bit, well, he’s back and plays a large role. He’s there with his own mission, perhaps not with the agenda of the government of course, and he’s trying to direct Cia in the right ways to both survive and to help his cause. Cia and Tomas are still together in this book ,and since she trusts him (sort of), she enlists his help in managing through these first years. What makes this story great though is that there’s a LOT going on and why in the Dystopian genre, much is expected, the path to get there is amazing. Cia’s guide Ian and her confidante Michal seem to be leading her in a direction and protecting her all the same – and what does that mean for her future? We learn that the heads of the Testing and University have it out for Cia and wonder what this will mean to her success and survival. Will she manage through her 9 classes (most students have 5, even the heaviest workload historically other than Cia has been 7) or will she fail? Redirection – what does that mean – really. What this brings to mind when we get a sense of what happens is The Hunger Games and District 13. Mind you i really hate to draw comparisons between stories i try not to do it, but in this sense, i think that it’s interesting. We’re constantly told throughout the series that if students are redirected because they are found not to have the skillset that is needed for their job, they are sent to other colonies to work. We don’ think that this is the case given that Cia and Tomas have NO recollection of anyone coming to Five Lakes that wasn’t from there or was an official. so, does it mean that they are killed? or sent out to areas that aren’t revitalized yet? curiosity here on my part, and i’m sure that Cia will figure it out. So, the ending of this bridge book in the trilogy was both surprising, and saddening. I’m a bit surprised on the turn of events of the final chapters, but i’m not surprised on the actions that are implied for book 3. I can’t wait until Graduation Day comes out – it can’t come out soon enough in my opinion. I love the perspective that this story has taken so far on what the earth has become after war and environmental upheaval….and i can’t wait to see who will survive and thrive. enjoy! 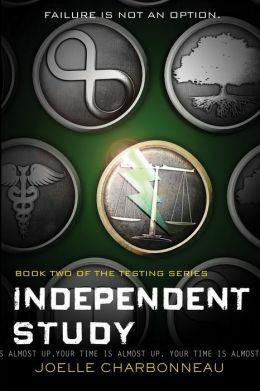 This entry was posted in Dystopian, Reviews, Young Adult and tagged Dystopian, Independent Study, joelle charbonneau, The Testing Trilogy by iscm13. Bookmark the permalink.